Warrendale has been looking rather trashy as of late. The Department of Public Works picks up bulk trash four times a year, which is actually more often than it in some of our suburban communities. Most people pay attention to the rules and don't put anything out until the night before our next bulk collection, which is this Friday, March 26. Unfortunately, there's also a handful of people who throw anything out any time that they feel like doing so. 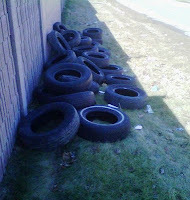 Illegal dumping by companies, such the two dozen scrap tires at right, only make matters worse. Therefore, I would like to remind everyone that illegal dumping is a misdemeanor punishable by a fine of up to $10,000. This is a lot more than the cost of disposing of these things properly. My Tip of the Week, therefore, is to encourage anyone with any information about illegal dumping or individuals who put bulk trash out well before the next scheduled pick up to report it. The City isn't as efficient at responding to these cases as they probably should be. However, they are getting better and your cooperation can make a huge difference. You can report this by calling 3-1-1 from a standard land line or by dialing (313) 224-4636 from a cell phone.